Clutter Warehouse - Everything Must Go! 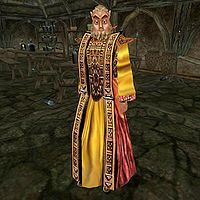 The Used Clutter Salesman is a Bosmer smuggler who can be found in the test cell Clutter Warehouse - Everything Must Go!. You will not encounter him under normal circumstances, as this cell is only accessible via a CenterOnCell command in the Console. He is a merchant, who will buy and sell everything (though he has no gold with which to buy things). He is even marked as a Spell Merchant, though he has no spells to sell. This page was last modified on 3 September 2017, at 06:18.